Long ago, the PR gods handed down a set of rules around media relations and competitive engagement for the business of public relations. For the most part, those unwritten rules stand up well. Yet, in the digital age, technology, time and trends have a way of changing the game. After all, each client is distinct, and every B2B PR program is unique. There’s no one-size-fits-all kind of philosophy in our business. Sometimes, ideas that are counterintuitive can foster dynamic invention. 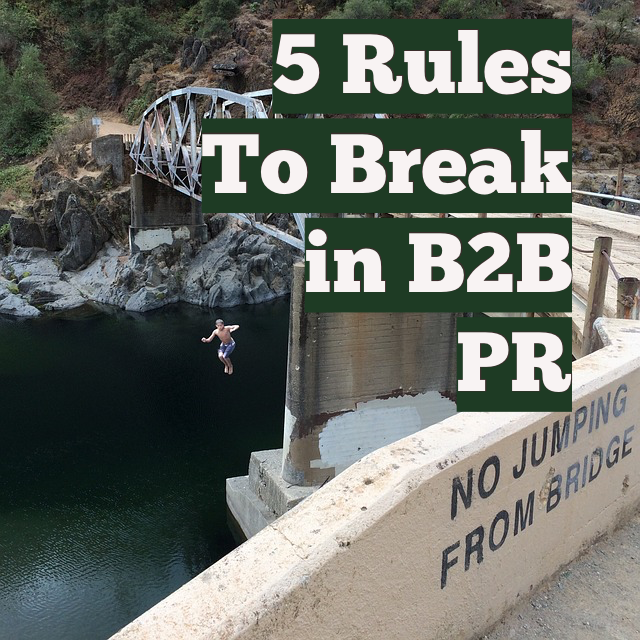 Here are some B2B and general public relations “rules” that were made to be broken – at least occasionally. To close deals, B2Bs must grapple with long selling cycles, often against competitors who look the same or make similar claims. These companies are typically selling to highly informed prospects whose decisions will be made carefully and after thorough research. A B2B label makes it sound like impersonal entities exchanging goods and services. But the truth is, enterprise businesses are made up of people, and decision-makers who greenlight enterprise purchases are influenced by other people’s opinions and expertise. They may also be reached through storytelling. B2Bs who want to stand out can break the rules by communicating in a rich, idiosyncratic brand voice. As a principal analyst at Forrester put it, “Like it or not, B2B just got B2C-ed; the consumerization in B2B is here to stay.” B2Bs can produce lively, entertaining PR content – and their spokespeople can have a personal point of view. Salesforce and Slack have broken this rule to their benefit. See our earlier post for B2C tips for adding life to B2B programs. It’s survival of the fittest, right? Let’s say you’re a software platform in tight competition with two or three companies with similar offerings. Potential customers in the middle of the sales funnel are likely aware of competitors and will be doing intense research into each offering. If you publish fair comparative information about all the companies on owned media on your site or through trade media channels, your firm will be viewed as more trustworthy than the average sales pitch. Plus, you’ve provided valuable content, which just might help win the business. But if you take this high road, make sure the association is with quality competitors and that the content is scrupulously accurate. Cooperation can lead to the sharing of knowledge and experience that makes everyone more fit. For insight into befriending competitors, check out this Entrepreneur article. Nobody likes having bad things said about them. In most cases, PR teams work quickly to combat any negative publicity, whether a business loss, a scandal, or a bad review. But if you’re a startup or a very early-stage company, a little negativity can introduce you to the world. A Stanford Graduate School of Business study indicated that “negative publicity can increase sales when a product or company is relatively unknown” and “the ‘negative’ impression bad reviews created seemed to diminish over time.” The study results are pretty counterintuitive, and we don’t recommend bad PR as a visibility strategy. However, if negative reviews or inaccurate perceptions are quickly countered with facts and constructive feedback, they can turn critics into advocates. A negative review, for example, can help a company learn from its mistakes and make things right with customers. If the business is responsive and the situation is corrected, it also builds credibility for that company. And it’s worth remembering that failure is an opportunity to rise in a bigger and better way. When it happens, it’s a BIG story. Everyone loves a comeback – just ask Bill Gates. Common PR tactics have informal rules, too. If you’ve sent a pitch to relevant media and it’s met with crickets, you can resend it, but conventional wisdom says you shouldn’t bombard media with emails. That’s true, but if a story’s right for a given trade or business reporter, it’s fine to sharpen the subject line and try again. If the pitch is truly a solid or compelling one, there’s nothing wrong with adjusting the pitch by changing the angle or reframing the story. Another way to reuse is to target different journalists and customize the approach for their background or beat. Sometimes a good story maybe be hamstrung by a deficient pitch, in which case it’s time to get feedback from a colleague and rewrite. See this earlier post for tips on pitching the media like a boss. From a literal standpoint, a PR pro shouldn’t utter the words “no comment,” because the phrase carries a “pleading the Fifth” connotation. Yet there are times when it’s best not to comment. As detailed in our strategic silence post, there are times when saying nothing may be preferable to speaking out. This is particularly true when the facts aren’t known, or when the chance of litigation is high. The social media mob can be another factor here; if trolls have targeted a business or brand, it may be best to let advocates leap to the defense, rather than entering the fray directly. But there are rules to breaking rules. Be cautious in choosing which situations, what timing, and which clients warrant coloring outside the lines. Good PR teams never bend the rules just to shake up the status quo; every risky tactic should have a goal that supports the overall PR plan. What other rules do you sometimes break?